thank you for sending me the new lot of Tet2. Unfortunately it also does not show the same result in IF as the first lot we bought. I attached some pictures so that you can see the different results. Thank you for sharing those results. It is disappointing to hear that this new lot has not provided a better result. I have raised this problem with you lab and quality control team. We are currently trying to ascertain why this change in reactivity has been observed with this antibody with the two most recent lots you have tried. And will be initiating further in house testing to try and understand why this problem may have occurred. I am sorry for the inconvenience this problem has caused you. 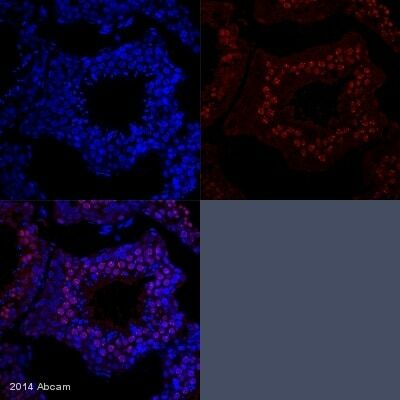 I am sorry but I do not have any other antibody I am able to offer which has been tested in ICC as yet, and until I am confident we have resolved the problem with the staining seen with ab94580 I don't want to provide you with another lot of this. You may want to have a look at the ab127416 which has been used in staining of paraffin embedded human bladder but I would not be able to guarantee how it would perform in ICC. Alternatively, if you would prefer I can provide you with any other antibody from our catalogue as a replacement, or a refund or credit note. I would like to ask, whether you have found a different lot number, which you can offer?! Since we have urgent experiments that should be done with this antibody we would be very pleased to have an antibody working well in IF. Since you asked me sending some pictures, I attached some IF images as well as the western blot. I can now confirm that we do have a different lot of ab94580 in stock which has been tested in both Western blotting and IF. If you would like I can arrange to send this to you. In order to arrange this, could you provide me with the order number on which ab94580 was purchased (the delivery address used)? Alternatively, if you would prefer, I can arrange for a different antibody altogether to be sent, or arrange for a credit note or refund. you asked me to fill in the questionnaire for IF and WB since I am experiencing difficulties with an antibody (see text below). Since the ab seems not to work only in IF, I only answered the IF Questionnaire. Thank you very much for that reply. That information has been very helpful in looking into this case further. I am sorry that the particular lot has not been producing the expected results. I am currently looking into whether we have a different lot number to offer, and how this has been evaluated. I will get back to you as soon as I have confirmation of this. In order to help understand the difference in reactivity you have observed, would you mind sending a few images? Particularly, the Western blot achieved with each of the lots tried as well as the IF images? Thank you for contacting us and reporting the problems you have been encountering with the Anti-Tet2 antibody (ab94580). I am sorry to hear you are experiencing difficulties with one of our products. We take product complaints very seriously, and investigate every product that we feel may not be performing correctly. I have checked in our stock and unfortunately we do not currently have any more stock for the lot number GR51556-1 available. However, I would like to investigate this problem a little further to see if we can identify a reason for this difference and it may be that I am able to offer you a different lot altogether. To this end, I would like to gather a little more information from you in regards to the samples tested, the protocol used and the results observed. I have therefore attached a questionnaire. This should only take 5-10 minutes to complete. If you could highlight the differences you have observed between the two lots that would be very helpful. Once I have receive the completed questionnaire, I will look at the protocol and see if there are any suggestions I can make that may improve the results. This information will also allow us to investigate this case internally and initiate additional testing where necessary. If the product was purchased in the last six months and is being used according to our Abpromise, we would be happy to replace or refund the antibody. 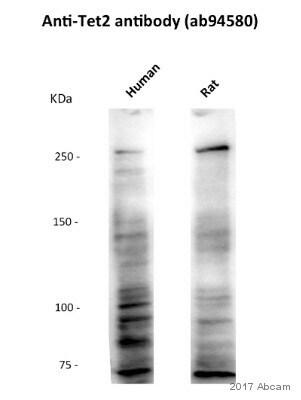 I ordered 2 tubes of this antibody recently, it cannot detect target protein anymore. It works pretty good previously, but recent product didn't work at all. Could you please send 2 new tube which been tested works? Thanks. I am sorry about the issues you have been having with ab94580 in western blot. The antibody is covered under our Abpromise for six months and is guaranteed to work in western blot on mouse & humansamples. If we cannot resolve the issue you are having with the antibody then I would be happy to either send a replacement antibody or to process a refund. 1 - What sample type are you using? 2 - Are you seeing any bands, no bands etc? 3 - How much sample are you loading? 4 - What type of blocking agent are you using? 5 - What primary antibody concentrations have you tried and how long do you incubate for? We do take all complaints on products seriously and we do our best to solve these problems. Thanks for your prompt response! We have had very good experiences with Abcam antibodies overall so it will not has any negative impact when it comes to future purchasing. In terms of the refund, I am wondering if we could get a abcam credit or gift card, which we may use towards future purchasing from Abcam. A refund back to original payment type may not be necessary because we buy antibodies from Abcam all the time. That will not be a problem. This credit will not be refunded unlessyou contact ouraccounting department to request the refund,so the credit can be kept on your account andredeemed against the invoice of a future order. Please make sure your purchasingdepartment is aware of the credit and if they have any questions about how to use it, they can contact our accounting department at mailto:us.credits@abcam.com. Please let me know if you have any questions or ifthere is anything else that we can do for you, and I'll be happy to help. I ordered two TET2 antibody from Abcam in June and tested them on our inducible system, hoping that I may use them to detect endogenous TET2 protein. To validate that these antibodies work as described, I tested these antibodies, along with a positive control, and anti-TET2 antibodies purchased from other companies. 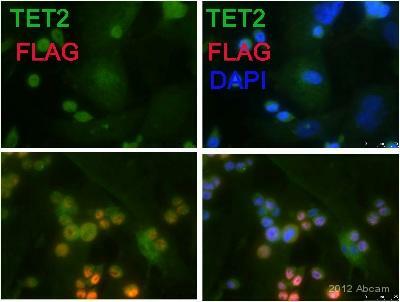 The TET2 overexpression cell line that we have generated express a Flag-tagged full-length human TET2. Without inducer, the exogenous TET2 levels are low; upon adding inducer, the TET2 levels increased over 10-fold. This was validated using anti-Flag antibody and thus Flag antibody was used as a positive control for the test. Whole cell lysate (50 ug) from either un-treated or treated samples were loaded on SDS gel (Bio-Rad 4-20% TGX gel), transferred to PVDF membrane (Bio-Rad tank transfer, 100 V, 90 min), blocked in 5% milk for 1 hour, and incubated with various primary antibodies for overnight at 4 degree. Membranes were further incubated with HRP-conjugated secondary antibody for 2 hours at room temperature and developed using ECL. As you may see from the attached figure, Flag antibody detected a band at ˜250 KD only when cells were treated with inducer (lower bands are proteolysis products). However, abcam anti-TET2 antibodies (ab94580, ab128178) failed to detected this band under neither conditions. An anti-TET2 antibody from one competitor did not work either. In contrast, an anti-TET2 antibody from another competitor successfully detected this band, and multiple proteolysis products, under induced condition, but not un-induced condition. The pattern recognized by this antibody looks very similar to that of Flag antibody, suggesting it can specifically recognize Flag-tagged TET2. This experiment has been done twice and the same results were obtained. Based on this, we conclude that the TET2 antibodies we purchased from Abcam did not work. According to your “Abpromise guarantee”, I am requesting a refund, or a credit for this order. Thanks. Thank you for contacting us and letting us know about the trouble with these antibodies. Thank you also for sending the information about your protocol and the image. Both of these antibodies may need to be used at lower dilutions than 1:2000 (ab128178 up to 1:500 and ab94580 at 1:1000), so this may be the reason there are no bands in the positive controls. I appreciate the time that you have spent working with these antibodies, so I have gone ahead and arranged the credit for you. If payment has already been made on the original order and you wish to receive a refund, please ask your purchasing department to contact our accounting department at mailto:us.credits@abcam.com so that we may gather the correct information needed for the refund. To avoid confusion, please ensure your accounts department is aware of how the credit note is being used.